Xiaomi has finally launched the Mi A2 and Mi A2 Lite at its ‘Global Launch’ event in Spain, and the two smartphones come with vertically stacked dual rear camera setups, AI camera features, and run on stock Android 8.1 Oreo. Part of the Android One initiative by Google, the phones are certified to offer an optimised stock Android experience, and receive timely software and security update. They do not feature Xiaomi’s own custom Android ROM – MIUI – unlike other Xiaomi phones. The Mi A2 is the successor of the Mi A1 smartphone launched last year in India as the first Android One smartphone from Xiaomi. Like the Mi A1 was the Android One variant of the Mi 5X, the Mi A2 is the Android One variant of the Mi 6X. The Mi A2 Lite on the other hand sports more basic specifications. Xiaomi has decided to price the Mi A2 at EUR 249 (roughly Rs. 20,100) for the 4GB RAM/ 32GB storage model, EUR 279 (roughly Rs. 22,500) for the 4GB RAM/ 64GB storage model, and EUR 349 (roughly Rs. 28,100) for the 6GB RAM/ 128GB storage model. The Mi A2 Lite price starts at EUR 179 (roughly Rs. 14,400) for the 3GB RAM/ 32GB storage mode, EUR 229 (roughly Rs. 18,400) for the 4GB RAM/ 64GB storage. Both smartphones will go on sale from August 10 in Spain via Mi.com, authorized Mi Stores, and channel partners such as Amazon.es and AliExpress. It will become available slightly earlier in France (July 27) and Italy (August 8). Both Mi A2 and Mi A2 Lite will be available in Black, Blue, and Gold colour options. As per the company’s announced availability for the two smartphones, the Mi A2 will be made available in India, while the Mi A2 Lite will not. The new Xiaomi Mi A2 has a 5.99-inch display with 18:9 aspect ratio and 2.5D curved Gorilla Glass for protection. The dual-SIM (Nano) smartphone will run pure Android 8.1 Oreo, and is powered by the octa-core Snapdragon 660 SoC (four 2.2GHz Kyro 260 cores + four 1.8GHz Kyro 260 cores) and Adreno 512 GPU. As mentioned above, it will come with up to 6GB LPDDR4x dual channel RAM and up to 128GB internal storage options. The highlight of the smartphone are the cameras, which feature AI integration for improved photos. The Mi A2 “AI Selfie Camera” has a 20-megapixel Sony IMX376 sensor with f/1.75 aperture, fixed focal length, and soft-LED flash. On the back is a “AI Dual Camera” setup with 12-megapixel primary Sony IMX486 sensor with f/1.75 aperture and 1.25-micron pixels, and a 20-megapixel secondary Sony IMX376 sensor with the same aperture but 2-micron 4-in-1 Super Pixel size. The rear camera setup is accompanied by phase-detection autofocus and dual-tone LED flash. 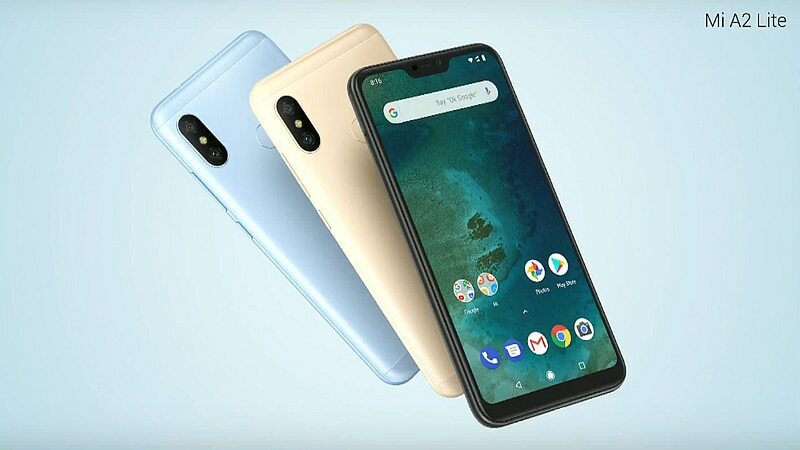 The dual-SIM (Nano) Xiaomi Mi A2 Lite has more basic specifications, and it will sport a 5.84-inch full-HD+ (1080×2280 pixels) display with a 19:9 aspect ratio and a notch. It is powered by the Qualcomm Snapdragon 625 SoC, paired with 3GB or 4GB of RAM option. It features 32GB or 64GB of onboard storage, that is expandable via microSD card (up to 256GB). In terms of optics, the smartphone bears a dual rear camera setup with a 12-megapixel primary sensor (1.25-micron pixels), complete with PDAF, and a 5-megapixel secondary camera. 5-megapixel front camera sensor. The company is also touting AI Portrait Mode for both front and rear cameras, as well as AI Scene Recognition features. It is powered with a 4000mAh battery and offer connectivity options such as 4G LTE, Wi-Fi 802.11ac, Bluetooth v4.2, GPS/ A-GPS, 3.5mm headphone jack, and Micro-USB. It bears a rear fingerprint sensor.